Johann Joachim Quantz (1697-1773) Concert E flat major for Horn, Strings and B.c. Georg Philpp Telemann (1681-1767) Concert D major for Horn, Strings and B.c. 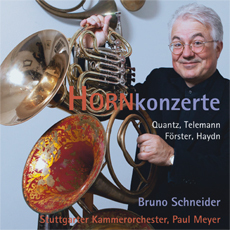 Christoph Förster (1693-1745) Concert E flat major for French horn, Strings and B.c. Since ancient times, the trumpet has been associated with warfare and the demonstration of power. The horn was traditionally used as a hunting instrument. They were both used as signaling instruments. Because of the limited number of notes available on natural trumpets and horns, they could not be used to play elaborate passagework, but their sound carried over long distances, which made them ideally suited to communication on a battle field or in a hunting ground. As brass instruments had been assigned these specific functions, it wasn’t until much later that they became integrated into orchestras—in fact, at first, they retained their original roles, as, for example, in operas, where they were used to depict war or hunting scenes. Only from around 1750 did trumpets and horns become attached to opera houses and royal courts on a regular basis. Their powerful sound added majesty to the agile melodies in the strings and woodwinds, and this new sound ideal laid the foundation for the grand and ceremonial Classical/Romantic Symphony. As early as 1700 (and especially north of the Alps), the horn also became very popular as a solo instrument, accompanied by strings and basso continuo. The main centers for horn-playing in the 18th century were Saxony, Bohemia and Vienna. So it comes as no surprise that the composers featured on this CD all had a connection with these places and regions. It is clear from the virtuosity of the horn parts in these works that the horn had by then evolved from its mere signaling function and become a versatile and sophisticated instrument, which could only be fully mastered by professional musicians. Stylistically, this CD casts an unusual light on the music of the mid-18th century: it contains works that are ostensibly from two different epochs—Quantz, Telemann and Förster belong to the Baroque period, Haydn to the Viennese Classics—but at the same time, there is a close musical affinity between the different horn concertos, which crosses stylistic boundaries. All of these works stem from a century and from a geographical region in middle-eastern Europe that stretched from Saxony to Vienna via Bohemia, and in which horn-playing was fostered intensely.